After three years of working alongside John as a dental assistant, Jackie wanted to further her career within the dental industry. She appreciates that dentistry not only has the aspect of helping people and making them feel good about themselves but it also allows her to use her artistic skills. For Jackie, there is nothing more rewarding than hearing that patients look forward to their appointments. 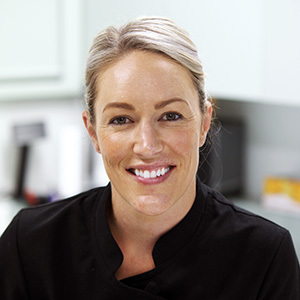 Jackie earned a Bachelor of Oral Health Therapy/Hygiene from Charles Sturt University at Wagga Wagga in 2011. In 2016, she obtained a Graduate Certificate in Dental Therapy (Advanced Clinical Practice) from Melbourne University. To stay abreast of the latest in the field, she completes the required 60 hours of continuing education every three years. Courses Jackie has taken include Pain-Free Dentistry, Tooth Whitening, and Orthodontics for Dental Therapists. Outside the practice, Jackie enjoys spending time with her two young children, who keep her quite busy. She and her partner are both involved in the local netball and football club playing every weekend throughout winter. The active and healthy family enjoys cooking, travelling and catching up with friends and family. Contact John Appleyard Dental today to book an appointment with Jackie!